We’ve been in Pennsylvania for two months and it feels like we are finally getting in the groove. All of my clothes boxes are unpacked (It took almost the entire two months *insert embarrassed emoji here*) and there are things hanging on the walls. I love the proximity to my family and our new church family is wonderful. I joined MOPS which has been a fun way to meet new friends,too. February is already looking like it’s going to be packed, but here’s a look back at January. Linking up with What I’m Into at Leigh Kramer! I love that our family gets to celebrate a birthday in January. It helps banish some of the Winter blues that set in after Christmas. My parents and brother were able to come in for James’ 1st birthday, and though we made it a pretty mellow day, we did spend his birthday eve crafting these awesome party hats out of kraft paper. A huge roll is 7 bucks at Walmart and I have an endless supply of scrapbook papers, pens and other crafty ephemera. This is a glimpse at what I’ve been reading. I do my book reviews in the middle of the month, so check back for my thoughts on these and a couple more. We are a bacon family. But, over the Thanksgiving holiday, my mom introduced us to Jones sausage. Game. Changer. They live in the freezer section. No filler or icky chemicals, just pure, sausagey goodness. I avoid our local Walmart at all costs, but I make an exception to purchase these mondo bags of sausage so we don’t run out. We had breakfast for dinner seven times in January and they all included this sausage. I love planners and calendars of all sorts. They feed my inner organizational diva. This year, I’m loving these beauties from Sugar Paper (via Target). I got the large one on the left for Christmas and then purchased a smaller one to complete my calendar needs. The larger planner has a month at a glance layout before the individual days. I use the month page to record what we had for dinner, anything I made (yogurt, bread, granola, etc. ), and dinner guests. I like to have a record of our eating habits and as we continue our real food journey, It’s helpful to have a visual guide of how long our homemade staples last. I record Bible reading, exercise, and prayers in the individual days. I bought the smaller planner for the blog. It’s slim with just a single double page spread for each month, but it’s just enough to record the posts that went live and jot down ideas for future posts. There are several pages in the back for bigger picture dreaming and brainstorming. I got a text from my mom on January 2nd telling me all about Bible Journaling and that she had Amazoned (absolutely a verb) me an ESV journaling Bible that would be arriving the next day. I am no artist, but everything about Bible journaling thrills me. The practice of turning what I’ve read into something visual helps me mediate and remember what God has shown me. I’ve filled my Instagram and Pinterest feed with Bible journaling inspiration and I just can’t wait to fill my Bible. Shanna Noel is an amazing resource as well. 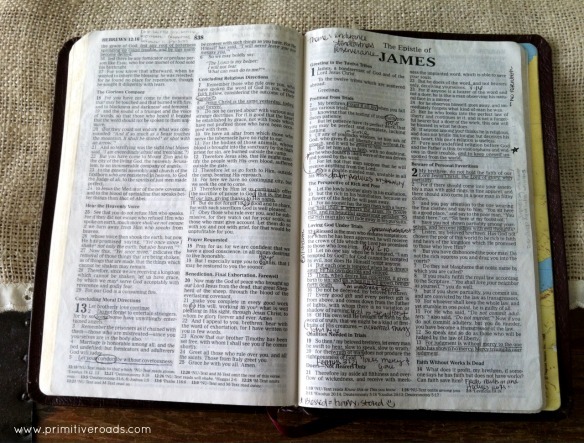 I decided to read the Bible chronologically this year. (Job was tough… I’m back in Genesis now.) Crossway has an amazing list of Bible reading plans in various formats. You can have the day’s reading sent to your email, put in your iCal or print it out! I got Tim an Aeropress and milk frother for Christmas. It’s been the gift that keeps on giving… My $30 investment replaced our cheapy espresso machine and it gets used everyday. I’ve been getting up at 6 to do my devotions and, more often than not, it’s the thought of a homemade honey latte that gets me out from underneath my warm covers. We like to explore a place through its food. One of our recent explorations was The Frying Dutchman in Kutztown, PA that makes and tops your donuts to order. If you’re local and haven’t been – it’s a must. Having worked at The Donut Man I have a very high standard for donuts. These definitely pass with flying colors. (Top to bottom: French Toast, PBJ, S’more, Powdered Sugar, PB Cup, Honey Graham). Pretty sure this will be a weekly tradition. And, yes, Tim and I ate all of these. My current everyday Bible is a very slim NKJV I received from my mom for my twentieth birthday. Just a few months later I headed off to Oxford for my first semester studying abroad with that Bible in tow. Since its maiden voyage, that Bible has been all over the world, from the States to Europe, Africa, and many places in between. I love my Bible. I love its textured “is it brown? is it maroon?” cover with the slightly chipped gold letters forming my maiden name in the bottom right corner. I love the quotes collected over the past six years creating a patchwork of truth on the first blank pages. I love my mom’s inscription written in her perfect cursive. I love seeing the letter Tim wrote me last summer stuck amidst the Psalms. I love the slightly bubbled pages of 1 Corinthians, aftermath of some rogue rain drops. I love the yellow colored pencil over references to God’s light. I love the sound of the paper thin sheets being turned. Most of all, I love the underlines. I love the notes crammed in the margins, some completely illegible. I love the dates, denoting a promise or a commitment, next to a poignant verse. All of those brackets, circles, cross references, notes, stars and underlines remind me that God speaks. He speaks to me. When I invest in His word, He is faithful to reveal Himself. Those markings prove to me that God is personal, alive and active in my heart. But I’ve become distracted. I read and I linger over the underlines and notes, inattentive to what God wants to show me today. I rely on the familiar for comfort and strength. My notes and underlines that speak life also create traps, snares for the nuggets hidden between the lines. I’ve decided to retire my beloved Bible for a time. A tabula rasa, if you will, takes its place. When I think to much about the blank pages ahead, I fear that they will remain blank. What if I’ve lost my ability to hear from God? What if God can’t speak to my heart? When that happens, I can just look at the slim spine sitting on my bookshelf and remember all the little piles of stones that reside among those pages, evidence of God’s faithfulness to His people, to me. My first few real Bibles (you know, the ones that have Jesus’ words in red and aren’t broken down into Bible stories instead of books…) bear the scars of an over eager highlighter hand and a juvenile view of what was meaningful enough to underscore with some neon yellow marker. 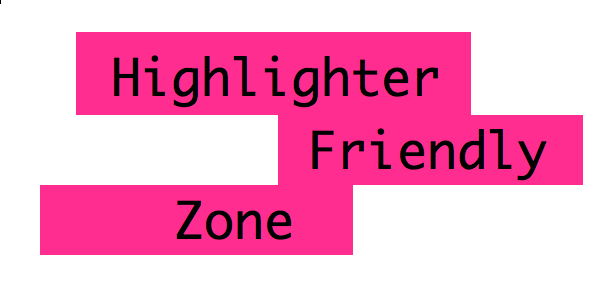 I remember coloring over large sections of Genesis and Leviticus thinking any verse with the words “Abraham” or “law” in it must be important and thus worthy of some highlighter love. This is not to say that family histories and Biblical statutes are not important, just that I was making the Pentateuch look more like Joseph’s technicolor dream coat than a thoughtfully underlined patchwork of spiritually significant passages. Kinda boring. Then, six generations in of living and begetting, living and begetting, Enoch appears on the scene. His life starts out pretty normal. He lives 65 years and then begets Methuselah. But Enoch didn’t just resume living after begetting (I really like that word) his son. 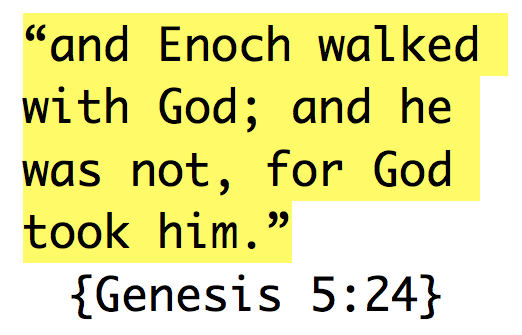 Enoch “walked with God.” For 300 years he walked with God and then – boop – Enoch was no more “for God took him.” And the other generations keep right on living and begetting as usual. 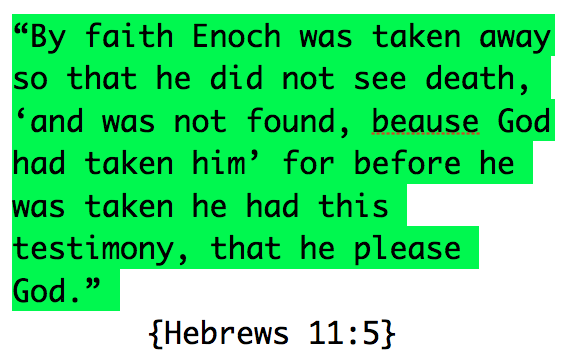 While some people in the Hall of Faith, found in Hebrews 11, have whole books devoted to their story, Enoch’s story gets a mere 6 verses in the middle of a genealogy. But the simplicity of his life’s example makes a large statement about what matters to God. The man so pleased his Heavenly Father with his faith that God spared him a physical death. That alone is awesome – for God to desire your presence in heaven so much He doesn’t wait until nature takes its course, but plucks you right off the Earth in an instant. Just wow. But what I love about Enoch’s life the most (and what I covet for my own life) is that he was remembered for pleasing God. Enoch’s testimony, the evidence of his faith, was that he walked with the Lord and it pleased his Abba. Based on my perfectionist and overly studious tendencies, it’s not a major shocker that I was an obsessive note taker in school. During lectures, in my textbooks, from a power point, I would be making notes. Even though I’ve been out of school for four years and, thus, not pouring over textbooks and the like, I generally read for pleasure with a pencil in hand, making notes or underling quotes I like or find interesting. Note taking has leaked into my devotional time as well. 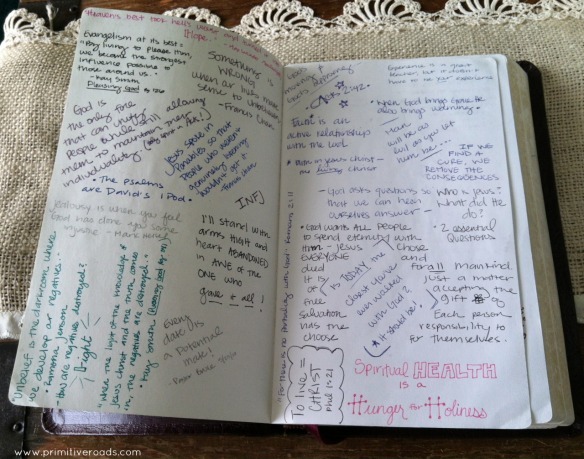 My Bible is underlined and scribbled in – there’s even a smiley face and doodle or two. Not only does this help me engage with what I’m reading, it also helps me recall what I learned when I run into it again. And let me be honest, parts of the Bible can get a bit dry. Sometimes I just need an external occupation to keep me interested and interacting with the words that I’m reading. Regardless of my motivation for reading the Bible with pen in hand, I’ve always been blown away by how God has used those notes to meet me where I am. He works in such timely and unexpected ways. During the three hour solo time at high school summer camp (July. Lake Shasta. Houseboats! ), I ran into some of my Bible scribblings. A year ago when NewSong was at houseboats, I was at Hume Lake as a jr. high counselor with my old church. It was a really difficult week for me. My parents had just left for a month. My boyfriend of a month was unreachable because Verizon cell reception is nil at Hume. My worth as a leader was being rocked because of the abundance of peppy Hume staff. I was feeling lonely, uncertain and way out of my comfort zone. Already feeling discouraged, I sought refuge in the Psalms. David’s honesty and ability to praise God amidst his struggles has always been encouraging – and I was feeling in need of some encouraging. I decided to read a Psalm a day, beginning at Psalm 35. Wednesday’s Psalm, in particular, gave me a sense of peace. In Psalm 37, David says, “find rest in the Lord. Do not fret. It only causes harm.” Not only was I being a major fret face, but I was fretting over misplaced priorities. Pining after Tim and feeling inadequate as a leader were keeping me from serving selflessly. After some initial resistance, I was able to start surrendering my desires for the future and move past some of my insecurities – at least put them aside while I was supposed to be pouring into students. Fast-forward 12 months and I’m at the park during solo time, following along with the devotion for Friday. I flip open to Psalm 37 as directed. A date was printed above it. 7.13.11. Exactly one year after finding solace in those words at Hume Lake, God directed me to the same Psalm. Though I was not dealing with the same type of fretfulness, God knew I needed to read David’s words again. 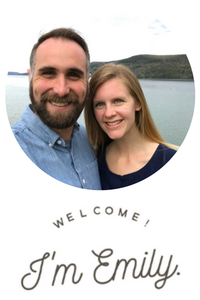 That boyfriend from a year before was now my husband and we had spent many months in the ups and downs of a ministry job search. I went in to the houseboats trip needing direction, confirmation, and peace about the most recent developments in Tim’s job hunt. God spoke a specific exhortation and encouragement to my heart from Psalm 37. Commit. Trust. Let God do His thing. Even though I don’t always follow the aforementioned formula, God takes great pleasure in orchestrating every detail of my life. I can certainly trip myself up, but He won’t let me fall. My hand is held fast and firm in His own grip.